1. Preheat the barbecue, griddle or grill to high then cook 2 of the aubergines for 10 minutes, turning frequently, until blackened and charred. Remove from the heat and set aside in a colander to cool. 2. Once cool enough to handle, cut in half and scoop the smoky flesh away from the blackened skin. For a deeper smoky taste add the blackened skin of one of the aubergines. Place the flesh (and skin, if using) in a small food processor with the tahini, garlic, lemon juice and some seasoning, blitz to a smooth purée and set aside. 3. Slice the remaining aubergines into ½cm-thick rounds. Mix the ras el hanout with the olive oil and use to brush each slice before placing on the barbecue, griddle or grill for 2 minutes on each side until bar-marked and tender. the parsley leaves. 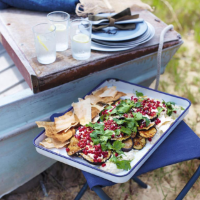 Sprinkle with sumac and serve with plenty of barbecued flat breads alongside.